Our patented rooftop wind turbine is currently available for online purchase or from our established nationwide dealer and installer network. 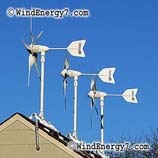 Small Wind Turbines – Our exclusive small wind turbine rooftop kit is currently available for purchase online. Or buy a small wind turbine from our established nationwide wind turbine dealer and wind turbine installer network. Our small wind turbine is a very high tech, quality engineered, rooftop wind turbine kit, invented and patented by WindEnergy7 LLC, an Ohio manufacturer. The small wind turbine has a 2 moving part generator using the strongest magnets in the world, less moving parts than any other competitor. Less moving parts in a small wind turbine means less wear, less noise and vibration making the small wind turbine quiet on your home’s roof. Our small wind turbine will run smoothly and spin your meter backwards. We have more installed rooftop small wind turbines than anyone because we actually have a working successful design, unlike all the wannabe rooftop small wind turbines on the internet. That’s because we have solved the noise and vibration that is the problem of all other systems out there who try to put small wind turbines on a rooftop. Buy a small wind turbine from this established nationwide wind turbine dealer and wind turbine installer network. Their small wind turbine is a very high tech, quality engineered, rooftop wind turbine kit, invented and patented by WindEnergy7, an Ohio manufacturer. The small wind turbine has a 2 moving part generator using the strongest magnets in the world, less moving parts than any other competitor. 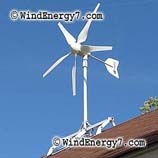 These patented small wind turbine rooftop kits is currently available for purchase online. Or buy a small wind turbine from our established nationwide wind turbine dealer and wind turbine installer network. Our small wind turbine is a very high tech, quality engineered, rooftop wind turbine kit, invented and patented by WindEnergy7, an Ohio manufacturer. The small wind turbine has a 2 moving part generator using the strongest magnets in the world, less moving parts than any other competitor. Small wind turbines are our business. 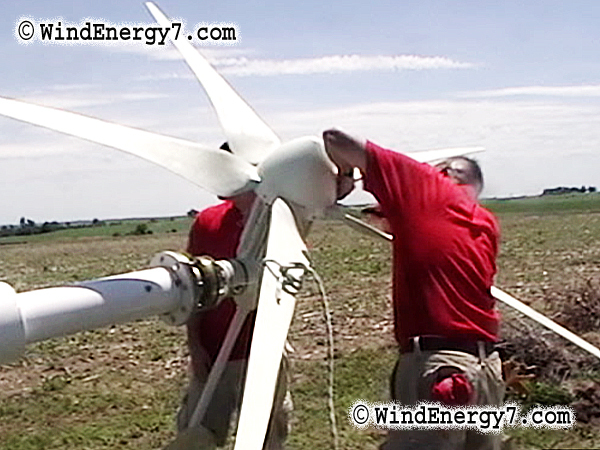 WindEnergy7 has patented the invention pictured here. Other systems will be too wobbly and noisy, having poor balance and vibrating parts. Small wind turbines, Home Wind Turbines, it’s what we do. WindEnergy7 . ComRoofMill™ is an exclusive invention of WindEnergy7. It’s the most advanced home wind turbine solution there is.TowerMill™ is our tower mounted system. If you have an acre or more and want a tower wind system. A Small Wind Turbine is a great investment. The day you install a Small Wind Turbine, you have the small wind turbine as a hard asset, a small improvement, creating the equal value of property improvement. Then, the small wind turbine makes free energy for you every day, a steady stream of valuable energy from your small wind turbine. The small wind turbine either reduces or eliminates your electric bill from now on. That’s just outstanding. And, the IRS pays for 30% of small wind turbine. @FabioCarvalho2050 Thanks man, there’s so many hours of work to get this so quiet and smooth. Congratulations. 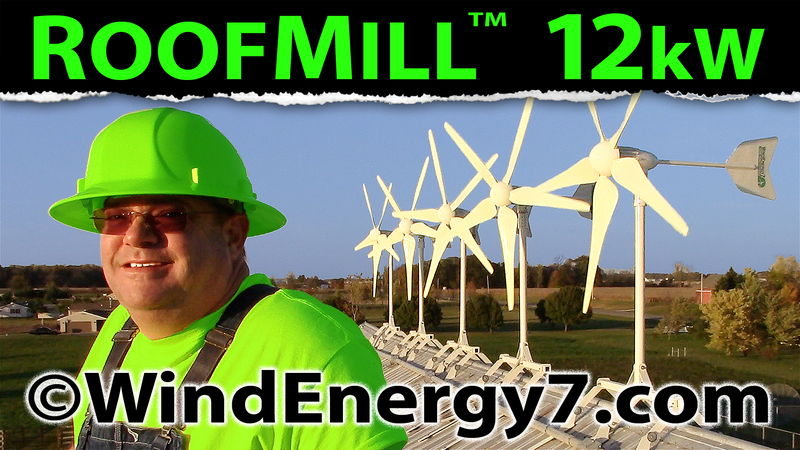 The system featured here RoofMill™, is the invention of WindEnergy7 LLC founder, pictured in the video. This patent pending invention released last year has won the Think Green Design Award 2010, in a contest by Allied Electronics. RoofMill™ Advance Home Energy System, it’s a grid tied home wind turbine generator together with rooftop solar panels in a complete “Whole House” system. It has emergency UPS for your home and can run your meter backwards selling unused power. Small wind turbines, nice. I made one also shows the home wind turbines to work really well. Check out my videos and give me a friend, favorite, subscription, or comment… Peace. Home Wind Farm™ comes in two options, The RoofMill™ and or the TowerMill™:. The RoofMill™, pictured below, is for residential, urban, and suburban areas where it is too crowded to erect a tower, or permitting is too difficult. Many homeowners do not have enough land to erect a larger windmill tower. The RoofMill™ uses the roof as a wind collector and concentrator to take advantage of what is called the roof effect of wind as it accelerates and is concentrated going over a roof peak. The TowerMill™, pictured below, is a more conventional use of wind power using a freestanding, 30′ to 60′ steel monopole tower to put the WindEnergy7 wind turbine upon. Most customers purchasing a The TowerMill™ system have atleast a 1/2 acre lot or live in suburban and rural settings. As featured in the videos here it’s a big hit with Farmers and ranchers to power their remote homes, barns, and water pumping stations. Whichever system the customer prefers our turbines are built almost identically but are of different size and power output to fit a customers need and budget. We have COMPLETE systems starting at about $6500 and can configure systems large enough to power anything a customer or community could require. WindEnergy7 is a manufacturer of both wind and solar products, so we can accomodate all csale of wind or solar project that a customer may have. Our 2 moving part turbines feature the elegant design that will last through the years of service. Where competitors have many, many parts prone to failure, our systems feature ElectroBrake™ speed limitation method and tried and true HardTail™ directional control technology which allow for the system to perform with less moving parts. The more moving parts a turbine system has, the more prone to wear and failure a turbine is. 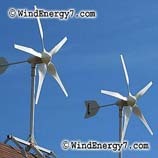 Hybrid Wind/Solar Power: All out systems feature wind and solar together as Hybrid Energy Systems. Our Jumbo Solar Panel upgrades shown below put out 197 watts per panel and add the reliability of solar charging to the systems. These panels are 197 watts each and are WindEnergy 7 high output polycrystalline modules. In cases of low wind your solar power will continue to deliver energy. Featured in the video above, the TowerMill™ is a larger tower mounted or pole mounted system that is a wind/solar hybrid energy system that puts out 4.0kW per unit. These Home Wind Turbines sit atop a 32′ to 60′ monopole tower. Customers can start with one or several. The Home Wind Farm concept allows a customer to step into this technology with a smaller investment and prove out their investment as they go. The Home Wind Farm™ is another innovation and invention of WindEnergy7. The modular turbine array concept we pioneered allows for easy bolt on expansion to a system. A customer can add more power at any time whether they are using the TowerMill™, or the roof mounted RoofMill™. Whether you need a TowerMill™, or a RoofMill™, WindEnergy7 systems are all designed as integrated hybrid wind/solar power. This is another innovation of WindEnergy7 LLC system design. Our Jumbo Solar Panels upgrades shown below put out 197 watts per panel and add the reliability of solar charging to the systems. Our great big WindEnergy7 high output polycrystalline modules are working in tandem making our system much more consistent and reliable at delivering energy every day. In cases of low wind your solar power will continue to deliver energy. Compared to a home solar only system, our wind turbines make power at night, on cloudy days, and when there’s heavy overcast storms. We have 4way™ Emergency Power which is another hallmark that makes a WindEnergy7 system better than any competing home energy system. With our systems you have 4way Emergency Power™ Wind. Solar, Battery Bank, and Grid as sources for power when you need it and your home will have power with or without the utility company. Since this Home Wind Farm™ features redundant systems, this home even has power if a turbine system were to get knocked out or fail, there are two complete systems that can each run without the other. To see more videos of our home wind turbines, go to — WindEnergy7.Com — and you can find info about becoming an owner, installer, or dealer of our rooftop wind turbine systems. There are still areas open for new dealers to become the local source for wind/solar systems. So, if you are interested in becoming a home wind turbine dealer fill out the Contact Form at — WindEnergy7.com — and we can see if your area may still be open for you to become the home wind turbine dealer for your surrounding county territory. You can buy a system online and we ship by UPS. You may become a wind generator dealer and or installer if you like, just fill out the Contact Form and let us know what we can do to help you. TowerMill™ Small Wind Turbine – This video is from Kansas where a wind turbine installer and dealer for WindEnergy7 has recently installed a small wind turbine system. This is the most advanced hybrid home energy system in the US, the Home Wind Farm™. The system has a maximum power output of over 10kW. This Home Wind Turbine system features redundant charging capability, wind and solar hybrid generation, emergency power with whole house battery backup, and more. The video below shows one of our most recent installations of our Home Wind Farm™ systems. The Home Wind Farm™ system is an exclusive innovation of WindEnergy7 LLC, an Ohio based manufacturer of home wind turbines and solar electric products. The image shown below is the layout by the Kansas WindEnergy7 dealer installer. This was part of the planning that optimizes the wind harvesting of the 3 turbine Home Wind Farm™ system. Wind patterns are considered and the turbines are located in the best possible place for wind harvesting.